February | 2012 | Kris Johnson's Blog…sort of. …and then the cashier asked whether the guy at the front of the line would be interested in signing up for a Target credit card. The guy said, sure, he’d love to sign up for a Target credit card. The cashier needed to see the guy’s driver’s license. The guy needed to enter his annual income on the keypad. The cashier guided him through the process, explaining that he should just enter what he thought, in his opinion, he was bringing in a year. 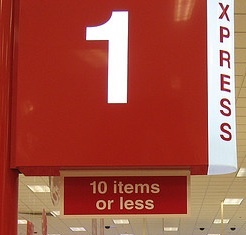 The cashier explained the privacy policies; he went over which data would and would not be retained by the store. The cashier explained how the credit card works—that payment must be made within 25 days of receiving the bill. The were still there, processing the guy’s credit application—in the express checkout line—when I moved to the other express checkout line…only to be told by the cashier there that she was closing her register. They were still there, processing the guy’s credit application—in the express checkout line—when I checked out at the photo counter. They were still there, processing the guy’s credit application—in the only open express checkout line—when I left the store with my two items.